Tuscany at 1:200,000 on a map from Marco Polo Travel Publishing with special features to aid route planning and an index in a separate booklet also containing street plans of central Florence, Livorno, Pisa and Siena. 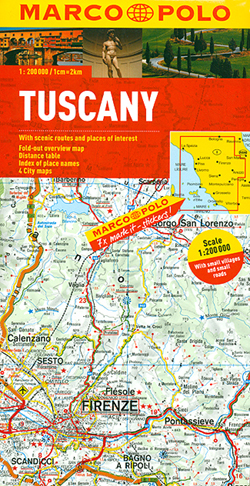 A fold-out extension of the map cover gives at-a-glance overview of the whole area covered by the map with the adjoining regions, making it much easier to find various localities on the main map and/or plan a route. 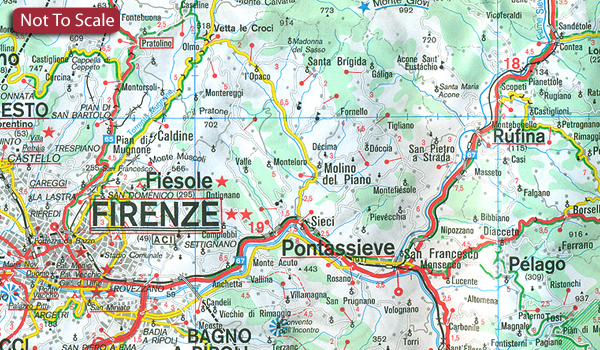 A set of seven peel-on/peel-off stickers, removable without damaging the map, is provided to make routes or locations more prominent when navigating. The map, with cartography from the renowned German publishers MairDumont, boldly stresses main roads and motorways in strong colours and selected towns in large letters, but also shows minor roads and villages in considerable detail. Road information includes toll roads, traffic restrictions and seasonal closures, gradient marking for steep roads, scenic routes, etc. Motorway services clearly indicate types of facilities available there. Railway network includes narrow gauge and tourist lines, cable car lines, and chair lifts. The map is particularly good for identifying geographical features. Picturesque towns and places of interest are given star rating, and other tourist information includes campsites and youth hostels, landmarks, recreational facilities etc. Latitude and longitude grid is drawn at intervals of 10'. Multilingual map legend and all information include English. 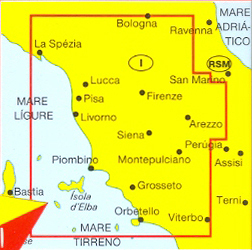 A booklet attached to the map cover contains an extensive index of place names including geographical features, plus street plans of central Florence, Livorno, Pisa and Siena. Also provided are a table with distances and traveling times and main traffic and speed regulations.